I've lived in Dublin for close to 7 years now & have managed to pretty much avoid Paddy's in the capital like the plague until this year. I know, how could I or why would I do such a thing?! Well I'm not really into the paddy-whackery or the drinking or any of it. Paddy's even down the country never appealed to me. Memories of watching floats of farm animals sprayed green and little Irish dancers frozen to death in their little costumes while trying to take shelter at the side of Donoghues' pub in Fanore while the rain pelted in straight off the Atlantic. That or being sent off to pick shamrock to pin to ourselves for mass the night before are memories that stick out in my mind, neither of which get me rubbing my hands gleefully in anticipation of March 17th. 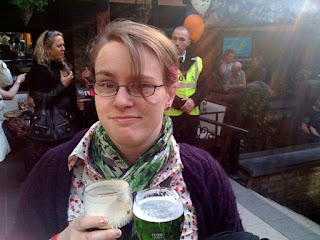 This year I somehow got caught up in the festival in Dublin. My first spin on a big wheel, waltzers & some other crazy spinny thing that nearly made my eyes pop. The theatre and creativity on the streets with the bands, the flash mob, the Spheres gang in the Docklands, and of course the big parade on Tuesday. Huge thanks to Marcus of Pix.ie for the last minute spare wristbands - check out the amazing photos from all the weekend fun & frolicks over on the site. ..:::This is what I do:::.. I make websites. I like music & dancing & have a terribly large soft spot for the 80s. I love cooking. I grow flowers n herbs & am a bogger at heart. I adore Sushi, chats with good people, snowglobes & funky fountains.